This was one of the latest starts I've gotten to a day where I hoped to ride a substantial distance. I spent most of the morning in the hostel lobby trying to catch up on my photo editing and journal writing and then posting updates to this site. Afterwards, in the lobby, I met a teacher from Philadelphia named Gregory who is traveling the country by motorcycle. We talked for a long bit about what we were both doing and how we came to be doing it, and then recommended a couple of books to each other. Gregory is one who is torn between living in the West and living in the East. His family and ailing mother live in Idaho and need his presence, but in Philadelphia he works with underprivileged children and he feels he is doing the Lord's work there. Although he didn't explicitly say it, I think that this trip is his opportunity to determine where heart and future will lay. After I left the hostel in search of food I had another one of those "mothership moments" that just keep happening. I was standing at an intersection considering which direction to go when a minivan pulled up next to me and I heard my name called. It was pretty much the whole crew from the RV, who were on their way to go for an afternoon rafting trip. Mark was staying behind in the RV, so after getting directions to where they were parked I rode over to give him a visit. The way we keep running into each other has been uncanny, but today might have been our final time to see each other. Over the next few days the mothership crew has a convoluted schedule whereby they keep riding a little bit and then shuttling the RV back and forth between airports as different friends join and depart. By the time it settles back down to just Mark, Emily, and Jackie, I suspect I will be three or four riding days ahead of them. Finally, after the day had slid into afternoon, I rode out of West Yellowstone and was soon riding alongside the Madison River and Hebgen Lake. 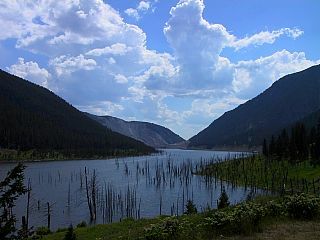 Hebgen Lake was, in August 1959, the site of one of the most powerful earthquakes in North America. A quake measuring 7.5 on the Richter scale triggered a massive landslide, which sent over 80 million tons of earth crashing down into the Madison River canyon. Homes were crushed or submerged, roads were wiped out, and a whole new lake was formed. The USFS has done a good job of documenting the event and of providing opportunities along the road to appreciate what happened and how the land was changed. One of the things that I found most surprising was that trees killed over forty years ago when the ground they grew on slid into the lake are still standing, with their long-dead trunks sticking out of the water like some ghost forest. In the early evening I stopped at a Bar and Grill for supper and just as I was about to be seated alone I was invited to join a family I had earlier met briefly at the earthquake visitor center. Dave and Nancy and their daughters Hillary and Eliza are all enroute to a family reunion in Salt Lake, and their Aunt Scotty who lives in nearby Red Lodge had joined them for the day. We visited with each other for about an hour and I did my best to be entertaining with tales of my trip so far. When the bill came Scotty insisted on paying for everyone's meal, including mine, and I thanked her for her generosity before getting back on the road. Over dinner Dave had mentioned that the three-week vacation they were now on was the longest they had taken since Nancy and he were married, and for some reason that statement continued to rattle around inside my head. I wrote a couple of days ago that living on the road was beginning to warp my sense of what is normal, but now I'm not so sure. It is starting to seem to me that instead we live in a society where what we consider to be normal day-to-day is instead what is warped. Why is it that for a couple married twenty years, taking a short three weeks for time together as a family was an exceptional occurrence? Why is it that for myself, a thirty-five year old man, taking three months out of my life for myself is something so beyond the normal that I have to explain it over and over? It seems to me that there is something wrong with the way we live our lives, or more accurately with the way we are told we are supposed to live our lives. Why do we go from childhood to school to careers to retirement without having more time for ourselves along the way? We are encouraged and expected to work and consume and pay our taxes, to spend the vast majority of our lives in pursuit of goals that ultimately benefit governments and corporations. But we have lost sight of the fact that the only reason institutions like governments and corporations are supposed to exist is to ultimately benefit the lives of the individual. More and more our society is being turned into the inverse of what it should be. Corporations gain more rights at the cost of the individual, governments secure more powers at the price of our liberty. And we just keep going about our daily lives, being told by the same entities that are taking more and more than we need to be happy with less and less. Now I really don't know who reads these web pages, or what you are looking for when you come to read them, but it probably isn't just to hear me ranting. Besides, these are a lot of big words coming from a person who isn't much more than a twenty-first century vagrant. But as I rode into the Montana sunset I couldn't help but get more and more frustrated by how I feel betrayed by the institutions which are supposed to exist for the benefit of mankind. Our corporations are awash in accounting scandals, the Catholic Church is mired in shame and denial, and I tire of hearing my government lie to me on a daily basis. If it weren't for the goodness and kindness of the people I meet every day on the road I might not have much faith left in us at all. Finally I had ridden enough. It was well after dark when I hit Cameron and I wasn't going to keep going by moonlight. There wasn't much to Cameron beyond a bar, cafe, and small campground, but it would suffice. I ordered a couple of cocktails to help shut my mind off so I could sleep, then spent the night sleeping under the stars. What kind of a freak would take 3 months off to ride a bicycle across the country and get all philosophical about it? Perhaps only those who have done it fully understand. I liked your rant--one thing that sickens me about the corporate world is that companies think they have a "right" to your labor. Whenever you take a sick day (much less a multi-month unpaid leave to take a cycling trip!) they act like you are stealing from them. No one has the right to make money off me. It makes me mad. On the other hand, most of us work ourselves to death unnecessarily for things we don't even need. "Every form of refuge has it's price." I lived summer after summer living on rivers as a guide in some of the most beutiful places in the world. Funny thing happened. I got sick of that and craved to work in an office somwhere. Hi Nick. Keep up the good work. I share your feelings having been on the road for 9 1/2 weeks. I'm back now starting retirement. The bike trip was the longest trip I ever took. Perhaps if I did it sooner some of my kids could have joined me, but they are all tied down by their careers and familys now. Enjoy the rest of your trip, I found Montana to be very beautiful. I've finally had time and a fast enough internet connection to browse through your web-page and read most of your journals (of course I am doing it at my first day back in my office!). I remember asking you to be candid and truthful in your journal entries--especially where we were mentioned--and I think you succeeded. Emily and I will always remember fondly the times riding with you in Wyoming and in part that made Wyoming my favorite state for riding. The miles ticked by as we rode two-abreast on the wide shoulders discussing copyrights, Ayn Rand, red rock geology and even last night's game of Boggle. We appreciated your intellect but were really pissed the day you felt so strong and rode right out of site! How dare you do that to, again quoting you, "an unloaded tandem"? As to your uncanny ability to happen upon, "the mothership crew" so often, I have cleaned and maintained the purple tandem and its appurtenances thoroughly and still can't find the homing device you must have attached. Or were we stalking you? Remember we did have a satellite dish on the Tioga. We test rode a Vision 'bent tandem Saturday and fantasize about across Australia in '04, probably sans RV. You in?